Reducing uncertainty in fisheries management: the time for fishers’ ecological knowledge. Valuing coral reefs: a travel cost analysis of the Great Barrier Reef. Fate of petroleum hydrocarbons in Catalina Harbor, Catalina Island, CA. 2016- Coordinator, MSc in Coastal and Marine Environments, NUI Galway. 2016- Lecturer, Discipline of Geography, NUI Galway. 2015-16 Fulbright US Scholar and Visiting Lecturer, NUI Galway. 2015 Resident Lecturer, School for Field Studies, South Caicos, TCI. 2014- Founder and President, St. Croix Science & Conservation, St. Croix, VI. 2013-14 Senior Policy Associate, US Southeast and Caribbean Fisheries, The Pew Charitable Trusts, Charleston, SC. 2012-13 Senior Advisor to the Director, NOAA Office of Communications and External Affairs, Washington, DC. 2011-12 Graduate Lecturer, Department of Geography, Texas A&M University, College Station, TX. 2010 Virgin Islands EPSCoR Fellow, University of the Virgin Islands, St. Croix, VI. 2008-09 Researcher, Department of Geography, Texas A&M University, College Station, TX. 2006-07 Teaching Assistant, Department of Geography, Texas A&M University, College Station, TX. 2004-06 Research Analyst, Marine Advisory Service, University of the Virgin Islands, St. Croix, VI. 2017- Graduate Dissertation, MSc Coastal and Marine Environments (TI 6109, Dissertation Advisor) – NUI Galway, Discipline of Geography, Galway, Ireland. 2017- Spatial Planning of the Marine Environment (TI 253, Lecturer) – NUI Galway, Discipline of Geography, Galway, Ireland. 2016- Research Project Design and Development (TI 335/350, Dissertation Advisor) – NUI Galway, Discipline of Geography, Galway, Ireland. 2016- Marine Spatial Planning and Policy (TI 6102, Lecturer) – NUI Galway, Discipline of Geography, Galway, Ireland. A critical environmental geographer examining marine spatial planning and marine resource management, with a focus on how policy decisions impact communities and economies dependent upon the health of those natural resources. Experienced in: social-ecological systems; marine spatial planning review; Q-methodology; behavioural and economic modelling; tourism; aquaculture; fisheries; public policy review; stakeholder-driven research; marine ecology and ecosystem characterisation; public outreach and media communications. 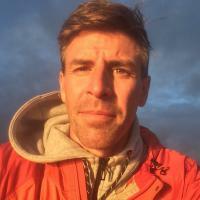 Research interests: spatial techniques for visualising policy and management; marine spatial planning policy; community engagement; coastal tourism; salmon aquaculture policy development; ecosystem goods and service inventorying; stakeholder conflict resolution and consensus-building. Carr, L.M. In Revision. Seeking stakeholder consensus within Ireland’s conflicted salmon aquaculture space. Marine Policy. Farrell D., Carr, L.M., and Fahy, F. 2017. On the subject of typology: how Irish coastal communities’ subjectivities reveal intrinsic values towards coastal environments. Ocean & Coastal Management 146: 135-143. Carr, L.M. and Heyman, W.D. 2016. Testing fisher-developed alternatives to fishery management tools for community support and regulatory effectiveness. Marine Policy 67: 40-53. Carr, L.M. and Heyman, W.D. 2014. Using a coupled behavior-economic model to reduce uncertainty and assess fisheries management in a data-limited, small-scale fishery. Ecological Economics 102: 94-104. Carr, L.M. and Heyman, W.D. 2012. “It’s about seeing what’s actually out there”: quantifying fishers’ ecological knowledge and biases in a small-scale commercial fishery as a path toward co-management. Ocean & Coastal Management 69: 118-132.